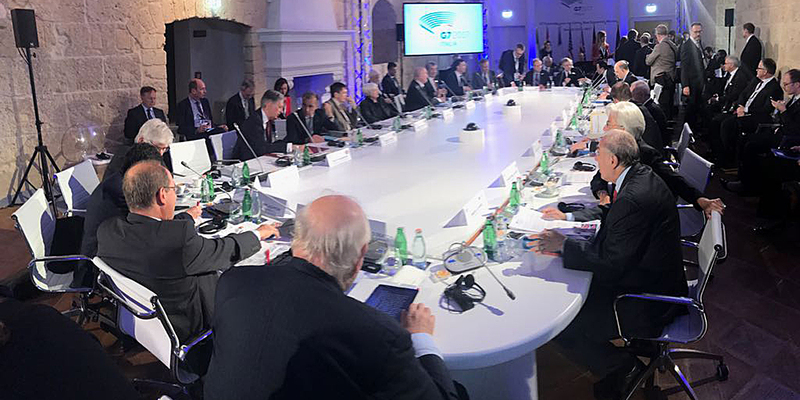 The G7 Finance Ministers and Central Bank Governors’ Meeting got under way today in Bari with a Symposium at the Castello Normanno Svevo. Not open to the general public, the topics discussed included the promotion of inclusive growth, the fight against inequality, and the links between finance, regulation and growth. During the course of the Symposium, representatives from the G7 countries and the international institutions involved in the Bari meeting (the European Commission, ECB, IMF, World Bank and OECD) interacted with a panel of world renowned economists. The first session, titled ‘Growth and inequality’, opened with contributions from Philippe Aghion, Professor of Economics at Harvard University, Giuseppe Bertola, Professor of Economics at the University of Turin, and Sir Angus Deaton, Professor of Economics and International Affairs at Princeton University and 2015 Nobel Prize Laureate in Economics. The discussions began with an analysis of current developments in the world’s economy, with particular emphasis on the conditions of the middle classes. Over the last thirty years, the income gap between developed and emerging economies has narrowed significantly, as have poverty levels worldwide. On the other hand, there has been an alarming increase in inequalities within the advanced economies, a phenomenon that according to the Symposium’s participants calls for a coordinated and inclusive response. Policies on education, technological innovation and integration are key to any solution: effective and broad ranging interventions from Governments and international organizations in these areas can help overcome the limits of the current development model, benefiting in particular the younger generations. The second session, titled ‘Finance, regulation and growth’, featured contributions by Philip H. Dybvig, Professor of Banking and Finance at Washington University’s Olin Business School, Randall Kroszner, Professor of Economics at the University of Chicago’s Booth School of Business and former Governor of the Federal Reserve System, and Hélène Rey, Professor of Economics at the London Business School. The debate centered on the delicate balance that must be struck at global level between the need to ensure the stability of the financial system and that of creating a climate conducive to sustainable, equitable and inclusive growth. In this regard, one of the themes that emerged very clearly from today’s Symposium was the need for the responses of regulators and politicians to take better account of the actual characteristics and requirements of a system undergoing profound and rapid change. In this area too, close and effective international cooperation can help to ensure that competition and technological progress become motors of integration, sustainable development and widespread wellbeing. The Symposium concluded with a keynote speech by the World Bank’s Chief Economist, Professor Paul Rome.